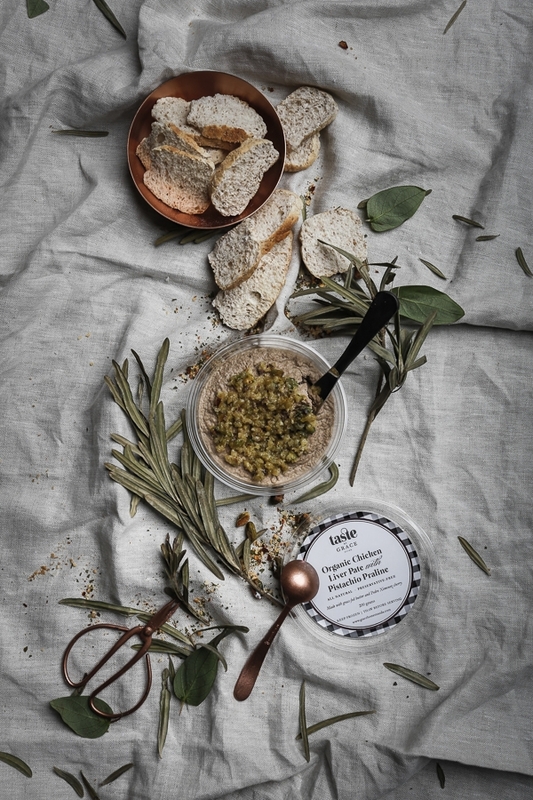 Grace Home Manila, the Manila-based lifestyle brand pioneered by Grace Barbers-Baja, is announcing its first repertoire of fine foods, aptly called “Taste by Grace Home”. 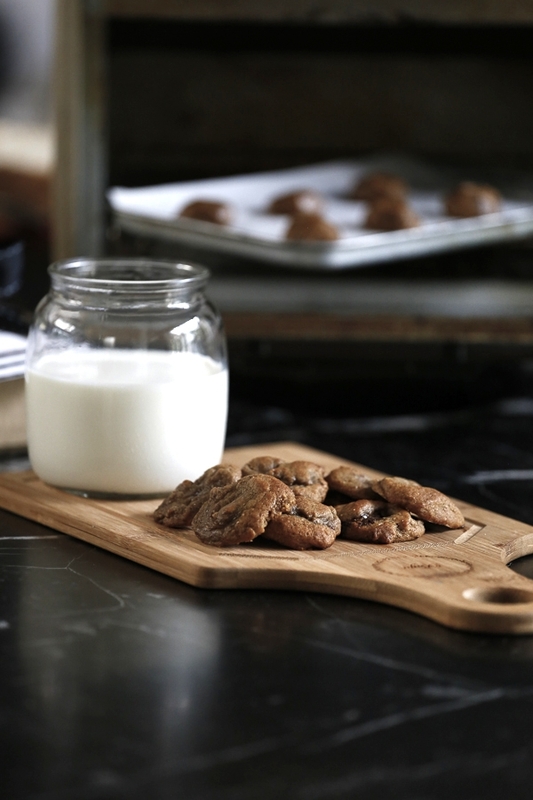 As a fitting addition to her already successful line of home products, Taste by Grace Home carries with it that same flavour of home that is both inviting and luxurious. 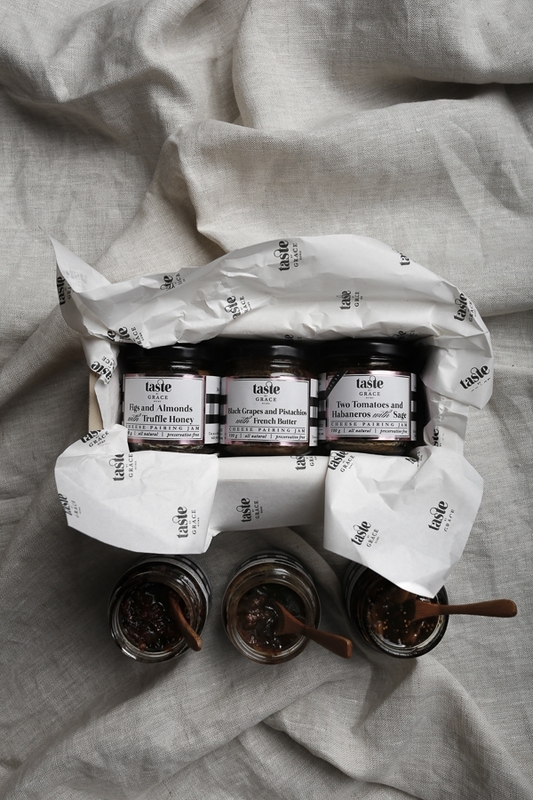 Launched in August 2017, the exclusive debut collection of 3 cheese-pairing jams, 3 hors d'oeuvres and a luxe cookie dough were conceptualized by Grace herself, inspired by her personal philosophy that living well should be a harmony of the senses, without sacrificing elegance, quality, style -- and, of course, taste. 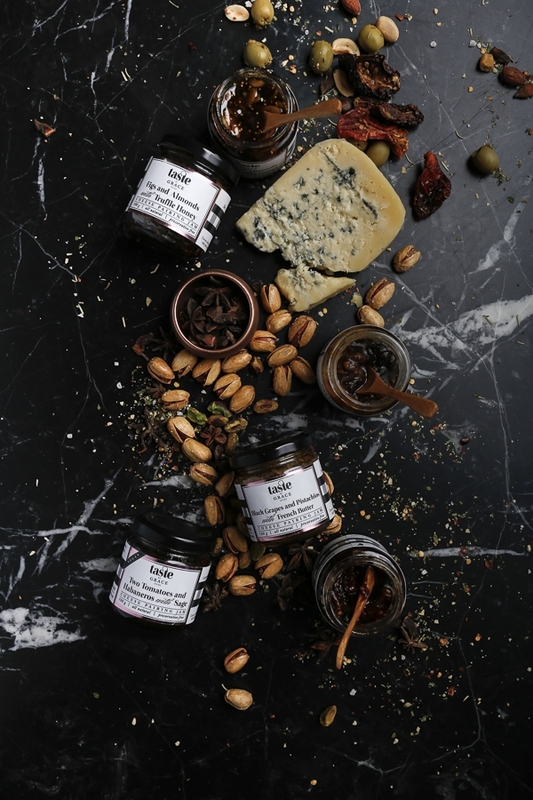 The suite of cheese-pairing jams — Figs and Almonds with Truffle Honey, Two Tomatoes and Habaneros with Sage, and Black Grapes and Pistachios with French Butter — are as intriguing in their flavor profiles as they are in their combinations. “I wanted this to be different from the usual single or combination fruit-flavoured jams you can buy in the supermarket -- because as we know, most of them are packed with artificial flavoring and preservatives.” Grace has also developed each jam for versatility: if not served with your cheeses and wine, they can also be served as relishes or condiments with your favorite grilled meats, or as dips and spreads by simply mixing the jam with cream cheese. 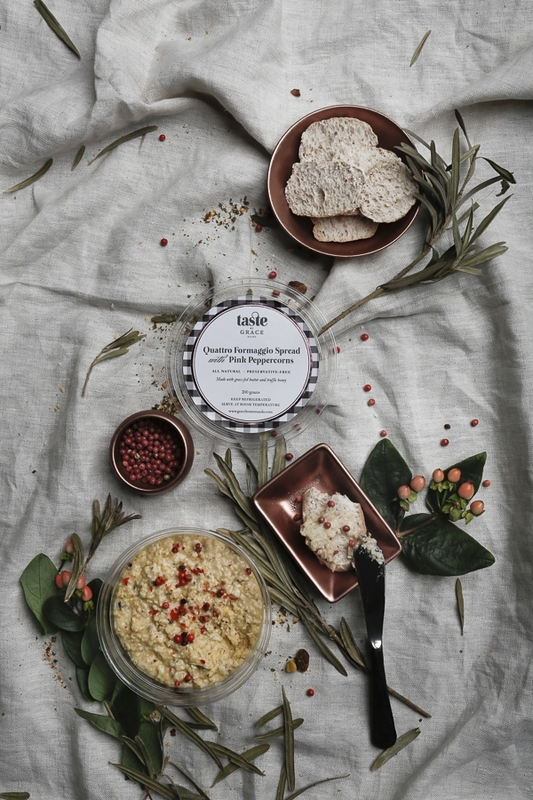 As for the hors d'oeuvres, there are three kinds: Organic Chicken Liver Pâté with Pistachio Praline, Manchego Curado with Almond Olive Tapenade and Quattro Formaggio Spread with Pink Peppercorns, a delightful spread akin to our favorite childhood cheese spread. As an exclamation point and fitting end to punctuate her fine foods line, Grace decided to — of course — create a dessert that would be both luxe and yet relatable; something both kids and grown ups will enjoy. Enter, her 70% Ecuadorian Dark Chocolate Cookie Dough, which isn’t your typical girlfriend-sleepover, movie-bingeing snack. It’s this sense of accomplishment that Grace wishes to impart to anyone who loves fine food and doesn’t want to fuss about it. “I want to tell people, especially all the working women and busy mummies out there, ‘You can be a hostess with the mostess, even with just a toaster... You don’t have to be Martha Stewart just to entertain!” says Grace. 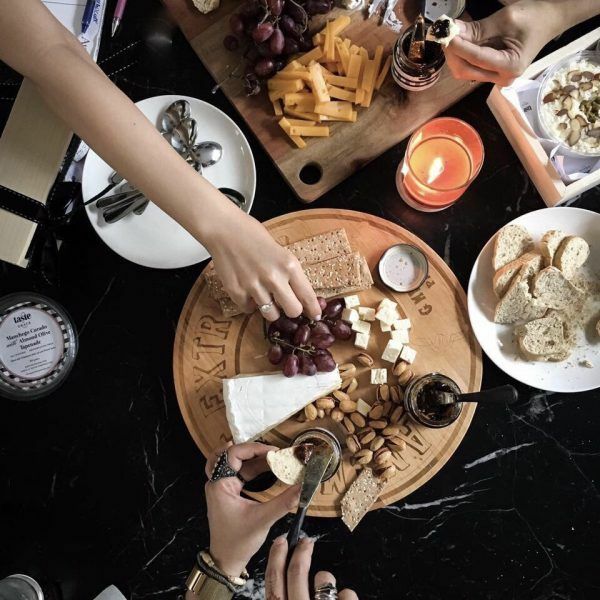 It is these oft-passed over elements and details of the brand experience that make Taste by Grace Home totally and entirely “Grace.” Taste by Grace Home collection was launched last August 25-27 at the ArteFino, in 8 Rockwell, Makati.